Corallorhiza striata – Striped Coral-Root. Near Tyee Lake, B.C., June 12, 2014. Perennial. Zone 1/2. Orchidaceae. From the southern Peace River district and through B.C. and the Pacific Northwest into California. Found in most Canadian provinces and in many American states, and into Mexico and Central America. 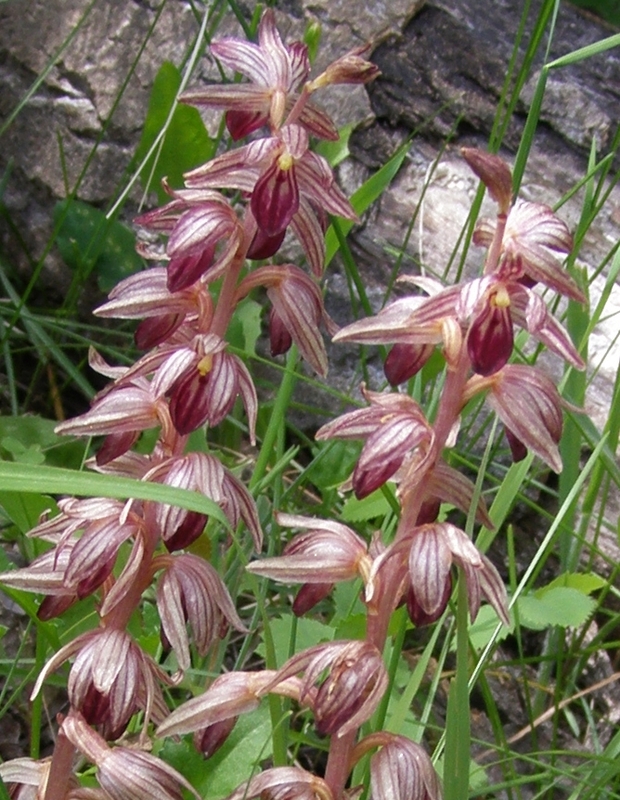 This unusual and rather rare orchid is occasionally found in the moist forests of the Cariboo-Chilcotin, most often in conjunction with rotting wood, as it is a saprophyte, a plant which feeds entirely off of decaying organic matter in the soil. As it has no need of chlorophyll, the leaves are merely small bracts on the stem, and there is no green coloration to any part of the plant. I was very pleased to come upon this thriving clump yesterday, on the edge of a wet meadow next to a fallen poplar tree. It may be found in bloom from May into mid-summer, and is often an unexpected find, having no foliage clump to mark its presence in the times before and after blooming, though the dried flower stems will give the sharp-eyed botanist a clue. The bloom stems arise from rhizomes – elongated underground stems – and vary from a single spike to a generous grouping. 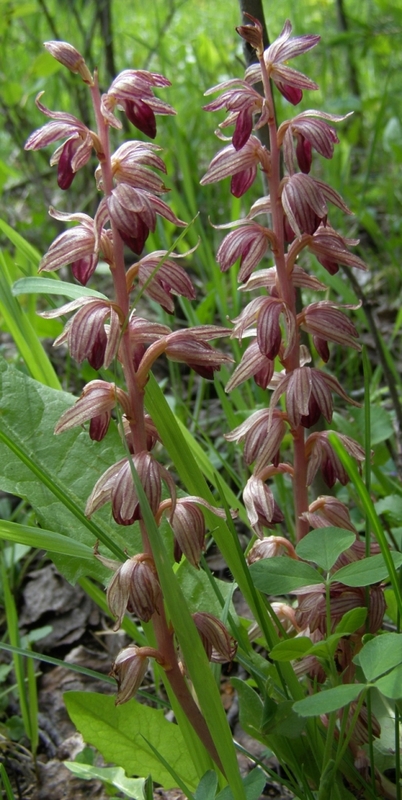 Stems are pale brownish-purple, and typical hooded orchid flowers are vividly striped with darker purple over a whitish background. Up to 20 intricate flowers are produced on each 12-inch (or taller) stem, and are pollinated by a variety of insects, including mosquitoes and tiny parasitic wasps. There is no detectable (to a human) fragrance. Seed capsules form after pollination, and mature many tiny seeds which are dispersed by wind or by disturbance of the dried flower spike. Like most members of the Orchid family, the Coral-roots are becoming increasingly rare as cultivation progressively destroys their habitats. The plant-lover should not attempt to transplant Corallorhiza species to the garden, because the odd, clubbed rhizomes are associated, for their work of extracting nourishment from decayed organic materials, with a complex group of fungi found only in natural sites. A plea, then, to enjoy in the wild, and to leave undisturbed in the hope that this unusual flower may continue to thrive as part of an intricately balanced natural forest community.